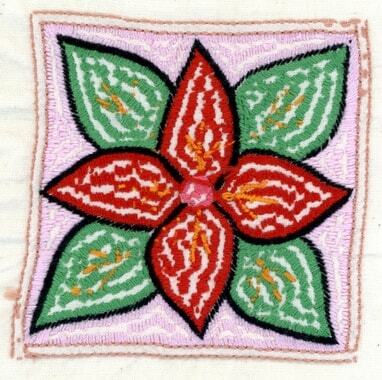 Pokhtadusi is an embroidery stitch often used to fill large areas. It is particularly useful for figurative designs and is generally known in Europe as Bukhara stitch or in Germany as “Klosterstich” because it was often used during medieval times in monasteries for embroidering large tapestries with wool yarn. 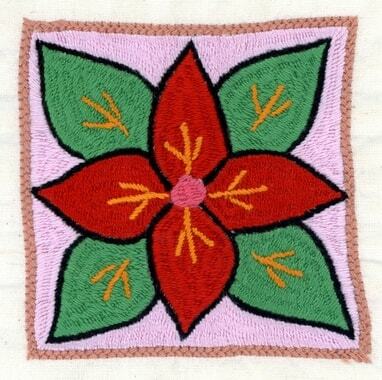 This stitch belongs to the textile traditions of Uzbekistan. Nomadic Uzbek took this tradition to neighbouring countries such as Turkmenistan, Tadzhikistan and Afghanistan. Ethnologists call it Bukhara stitch after the historic Uzbek city where tapestries called suzanis were traditionally embroidered using this stitch. Insert a piece of cloth (i.e. from a sheet) in a frame. 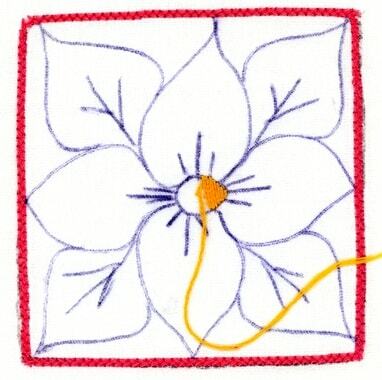 Thread about 60 cm of embroidery thread into a needle and knot it. Bring the first stitch up in the middle of the frame at (A), and reinsert about 2 to 3 cm above the starting point at (B). This long stitch will be overcast with small stitches at intervals between (A) and (B). About a half a centimetre distance from (B) bring the needle up at (C) directly on the left side of the long stitch. The thread is then laid over the long stitch and immediately reinserted. (D being to the right of the long stitch). (C) and (D) are more or less opposite one another but just millimetres apart. This overcasting continues at intervals for the entire length of the long stitch until the needle approaches (A). Bring the needle up just past (A). 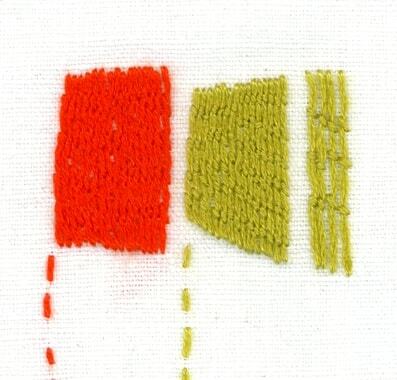 This new long stitch is laid parallel and close to the first one (A to B) and the same procedure will be repeated. The angle and the length of the overcasting as well as the distance of the stitches from one another provides a different effect although the principal remains.